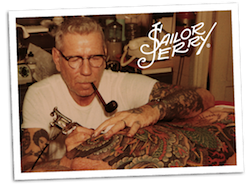 Sailor Jerry Spiced Rum, created to honor the father of American old school tattooing, Norman "Sailor Jerry" Collins, has aligned with the iconic, American Harley-Davidson Motor Company for a multi-year partnership. To commemorate the kick-off of the partnership, Sailor Jerry Spiced Rum will be unveiling a series of twenty-two customized Harley-Davidson motorcycles designed by high profile artists and visionaries from around the United States including Harley-Davidson's own Styling Team, at a celebration this spring. This 360-partnership will come to life in bars, restaurants, Harley-Davidson dealerships and joint celebrations around the country. Consumers can expect a series of shared events and moments from the two iconic brands, leading up to Harley-Davidson's 115th Anniversary in 2018. The first official venture together is the series of customized motorcycles created by acclaimed artists from around the country. The participating artists include a range of innovators with backgrounds in tattoo design, mural paintings, street art and automotive design. Acclaimed tattoo artists Jonathan Valena aka JonBoy, Oliver Peck, and Megan Woznicki aka Megan Massacre have designed a selection of bikes as well as popular Miami-based muralists, Alexander Mijares, celebrated automotive designer, Michael "BuckWild" Ramirez and artist L'Amour Supreme. Each artist was tasked with interpreting the infamous flash art style of Norman "Sailor Jerry" Collins into their unique motorcycle design. Members of the Harley-Davidson Styling Team round out the group of artists and use their deep knowledge of Harley-Davidson history to inspire their unique designs. The motorcycles will be unveiled in a celebration at the Harley-Davidson Museum in Milwaukee on May 2, 2017 that will be open to consumers and include exciting festivities for all attendees. Following the celebrations, these bikes will not become a part of the exhibit, but instead be available for viewing around the United States all summer 2017 at liquor retailers, Sailor Jerry's Fleet Week New York celebrations, at the Harley-Davidson Museum and more. Fans of Harley-Davidson and Sailor Jerry Spiced Rum will have a chance to win a motorcycle through a sweepstakes program kicking off on May 15, 2017. There will be twenty-two total bikes available to win. To enter, participants can log on to www.SailorJerry.com/Harley-Davidson and can receive additional information on the sweepstakes. "Between our shared American roots, values and traditions, collaborating with Harley-Davidson is an exciting and natural fit," said Sailor Jerry Spiced Rum Senior Brand Manager Josh Hayes. "Harley-Davidson shares Sailor Jerry's genuine Americana values for freedom and living outside the lines. With Harley-Davidson, we look forward to a long partnership that celebrates our shared brand beliefs." The collaboration of these two Americana-steeped brands is a true testament to their rich histories of honoring the traditional values, passions and purposes of the men for whom they are named. After serving in the U.S. Navy during WWII, Norman Collins dedicated his life honing the art of tattooing out of his shop on Hotel Street in Honolulu. Collins' shop became the must-stop destination for sailors on their shore-leave. His unique flash-art style started a movement that still inspires artists today. Harley-Davidson, named after founders William S. Harley, Arthur Davidson, William A. Davidson and Walter Davidson, has become an American icon since its founding in 1903. Since its first motorcycle, Harley-Davidson has been dedicated to fulfilling dreams of personal freedom – from exceptional custom experiences, innovative products and precise manufacturing. Together, these two brands are excited to begin a partnership that combines their joint passions and values. 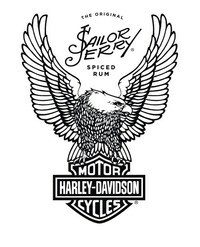 "Sailor Jerry Spiced Rum and Harley-Davidson are all about freedom of expression and customization, whether that is expressed by a Norman Collins tattoo or a bike," said Scott Beck, Harley-Davidson Director of Marketing. "We are struck by the natural ties Sailor Jerry has to the motorcycle culture." Harley-Davidson Forty-Eight: With its bulldog stance, fat front tire and narrow profile, the Forty-Eight exudes bare-boned attitude. A new seat, mag wheels, and wider 49mm forks and adjustable rear suspension provide an even more muscular, comfortable ride. The iconic 2.1 gallon peanut tank sports '70s inspired graphics and floating brake rotors and blacked out slotted exhaust add to the fresh new look. 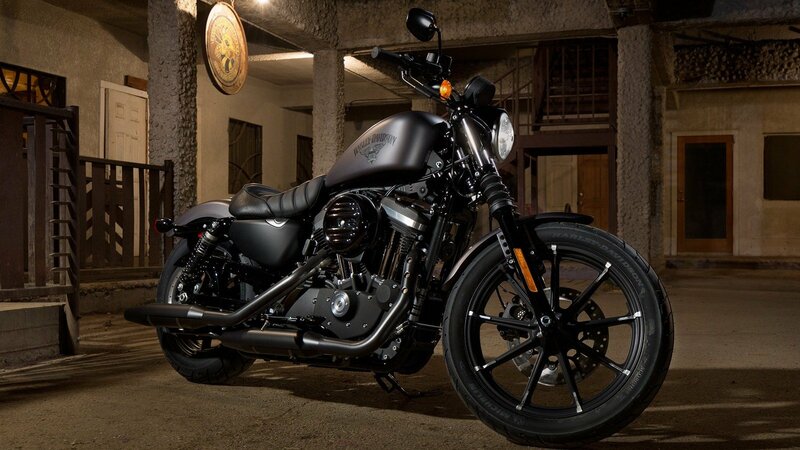 Harley-Davidson Iron 883: Bare-knuckle minimalism and garage-built style featuring bullet design detailing, straight cut mufflers, a low drag-style handlebar, front fork gaiters, chopped rear fender and a solo tuck and roll seat. All new adjustable rear shocks and front cartridge forks provide stability and comfort. 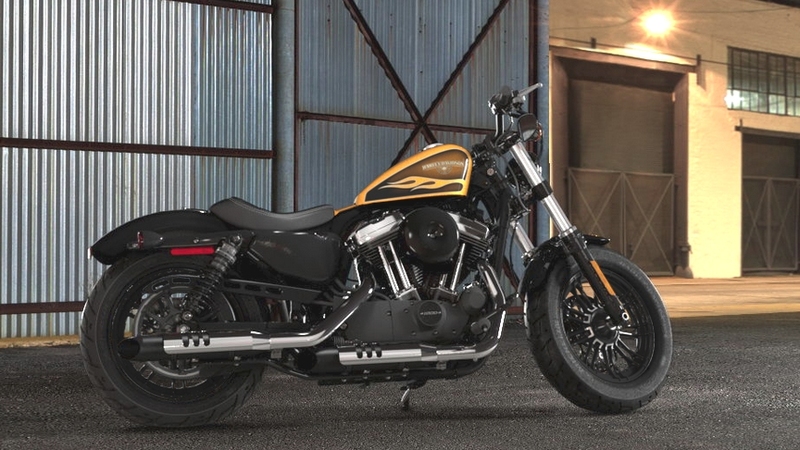 The Iron 883 is a nimble urban machine that kicks asphalt. 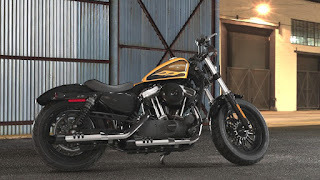 Harley-Davidson Roadster: With a profile reminiscent of racing Sportster motorcycles from the 1950s and 1960s, Roadster joins Harley's Dark Custom lineup with a minimalist design inspired by classic models and current trends in stripped-down custom bikes. A rider's bike, the Harley-Davidson Roadster boasts premium suspension components and a balanced, athletic stance that connects the rider to the road. William Grant & Sons Holdings Ltd is an independent family-owned distiller headquartered in the United Kingdom and founded by William Grant in 1887. Today, the global premium spirits company is run by the fifth generation of his family and distils some of the world's leading brands of Scotch whisky, including the world's most awarded single malt Glenfiddich®, The Balvenie® range of handcrafted single malts and the world's third largest blended Scotch, Grant's®, as well as other iconic spirits brands such as Hendrick's® Gin, Sailor Jerry® Spiced Rum, Tullamore D.E.W.® Irish Whiskey, Monkey Shoulder® Blended Malt Scotch Whisky and Drambuie® Scotch Liqueur. William Grant & Sons has been honored as "Distiller of the Year" by the prestigious International Wine & Spirit Competition and International Spirits Challenge 11 times over the past 16 years. Founded in 1964, William Grant & Sons USA is a wholly-owned subsidiary of William Grant & Sons, Ltd. and features one of the fastest growing spirits portfolios in the USA with brands including Glenfiddich, The Balvenie, Hendrick's Gin, Sailor Jerry Spiced Rum, Tullamore D.E.W. Irish Whiskey, Drambuie, Milagro Tequila, Grant's, Hudson Whiskey, Gibson's Finest, Monkey Shoulder, Clan MacGregor, Reyka Vodka, Solerno Blood Orange Liqueur, Montelobos Mezcal, Ancho Reyes, Flor de Caña Rum, Art In The Age, The Knot and Raynal French Brandy. For more information on the company and its brands, please visit www.grantusa.com. Sailor Jerry Spiced Rum was created to honor Norman "Sailor Jerry" Collins, a Navy vet who built his rep inking soldiers and sailors in WWII-era Honolulu where he established his legendary tattoo parlor and himself as the undisputed father of American old school tattooing. Crafted in the traditional Navy way by William Grant & Sons, Sailor Jerry Spiced Rum is bold and smooth, with hints of caramel and vanilla. Just like the man who inspired it, this 92 proof rum speaks for itself and holds itself to the traditional values and standards of craftsmanship that Norman Collins espoused. Made in America from Caribbean Rum and blended with spices including ginger, cinnamon, clove and vanilla, Sailor Jerry Spiced Rum is an exceptionally smooth drink with an ABV of 46%. From the liquid itself to the packaging, every detail of Sailor Jerry Spiced Rum stays true to the vision of Norman "Sailor Jerry" Collins. For more information, visit www.sailorjerry.com or follow www.twitter.com/sailorjerry and www.facebook.com/SailorJerry.